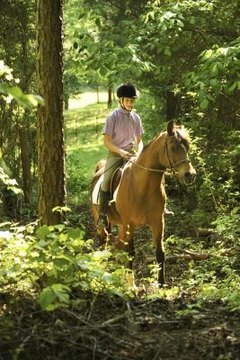 You may imagine that pleasure riding obviously refers to trail riders who spend hours exploring the wilderness, happy as could be to clopping between sun-dappled trees -- with other horses ahead, sauntering along on a perfect day. But the term “pleasure riding” can also refer to a rather different activity within the world of horse shows. Outside the realms of the horse show world, pleasure riding refers to any type of riding you do simply for your enjoyment. Under the popular definition, pleasure riders do not chase points, trophies or championships. This term refers to those who only do trail riding with their horses. Within the horse show circuit, "pleasure" riding takes on a whole new connotation. While pleasure classes aim to provide an enjoyable, relaxed environment, these are still highly structured riding disciplines with specific qualifications and rules. Untrained horses just circling around the ring at the appropriate gait are highly unlikely to succeed at "pleasure" horse show classes. Pleasure classes, especially western pleasure, feature a distinct style of horse behavior and movement that does not typically occur naturally. Western pleasure is one of the most competitive and well-known Western riding disciplines. The term “pleasure” comes from the relaxed appearance of the horse and the style of riding used in the show classes. In reality, Western pleasure horses have countless hours of training put into teaching them to achieve this look. Horses have been trained to jog and lope extremely slowly and keep a very low headset. Riders wear full show regalia, and the saddles and bridles feature intricate tooled designs and silver decorations. In an English pleasure class, judges evaluate the horse's performance rather than the rider's abilities. These show classes require the horse to demonstrate appropriate behavior and movements during either the walk and trot, or the walk, trot and canter. As with Western pleasure, the horses who win these classes are extensively trained animals that have been taught to move in a manner considered acceptable by the judges.